Once again, Wings is busy planning for a still-growing series of summer Running & Fitness Camps. These two-day workshops are designed to promote healthy lifestyle choices among American Indian youth, ages 6-18 years old. 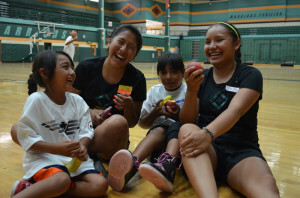 Held at schools and community centers, these fun-filled day camps offer running-specific instruction/activities and Native-tailored field and ball games. Camp facilitators are also trained to deliver information to participants about healthy eating, type-II diabetes, and Native American running history. The best facilitator/assistant facilitator candidates are young, energetic, hard working, athletic, well spoken and passionate about positively impacting the health and wellness of Native youth. If hired, you will be required to attend the Wings Indian Running Coaches’ Clinic and Leadership Training June 4th-9th in Santa Fe, NM. Unless otherwise specified, summer employees are responsible for their own transportation to and from the training session. Camps begin June 11th and end the last week in July. All employees must be age 16 or older.